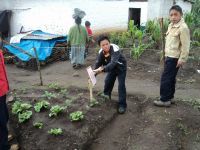 GUATEMALA CITY, Aug 11 2011 (IPS) - “Yesterday I planted 20 broccoli plants at home. God willing, they will grow and we will be able to eat them,” said 12-year-old Juan Francisco Ordóñez, a student at a school in San Cristóbal Totonicapán where a school garden has been established in an attempt to alleviate hunger. By the end of this year, the Alliances to Improve the Situation of Children, Food Security and Nutrition programme, initiated in 2010, will have planted a total of 44 school gardens in the western Guatemalan department (province) of Totonicapán. While serving as a teaching tool, the gardens are also aimed at combating the high rates of chronic malnutrition in this Central American nation. “We learn how to plant vegetables and when to water them. We’re growing radishes, beets, onions, chard, hierba mora (Solanum nigrum) and broccoli,” explained Ordóñez, a sixth-grade student who has planted a similar garden at home to help his parents and six brothers and sisters. The signs of hunger are evident in the classroom. “It is reflected in a lack of concentration and poor performance. When the children see that the school snack provided by the government is being prepared, their attention wanders,” he commented. In early July, the school’s 211 students celebrated their first harvest. “We made a salad with the chard and also fried it and made soup, but it was all eaten at the event,” said Tax. “For the next harvest, the idea is to eat half and sell the rest to raise funds to buy more seeds and expand the project,” he added. The garden is also used to teach mathematics, geography and values like cooperation, respect and discipline. Preschool students learned about shapes through geometrical figures placed in the garden, while the sixth-grade students were taught about the mathematical rule of three. Children in other grades learned about the nutritional properties of the various vegetables grown. The school garden programme is supported by international agencies like the United Nations Food and Agriculture Organisation (FAO), the World Food Programme and the Pan American Health Organisation, as well as the Guatemalan Ministry of Agriculture, Livestock and Food, the Secretariat for Food and Nutritional Security, the Ministry of Public Health and Social Assistance, and the Ministry of Education. Financial support is also provided by the government of Spain. In Guatemala, with a population of 14 million, 49.3 percent of children under the age of five suffer from chronic malnutrition, which is the highest rate in all of Latin America and one of the highest in the world, according to the United Nations Children’s Fund (UNICEF). The situation is even more serious in Totonicapán, where the school garden programme was initiated. More than 74 percent of children under the age of five suffer from chronic malnutrition, while almost 33 percent face severe malnutrition, according to the 2008-2009 National Survey on Maternal and Child Health. The effects of chronic malnutrition include delayed growth and learning disabilities, while severe malnutrition is evidenced through the extreme thinness caused by hunger. “The number one outcome this initiative is aimed at is for families to have more food available to eat,” FAO-Guatemala representative Paúl Orozco told Tierramérica. How is this achieved? “Technical specialists come to the schools and teach the children about raising vegetables, food security, malnutrition, hygiene and other aspects related to food production,” explained Orozco, adding that these lessons are also shared with their parents and teachers. The institutions that support the programme provide gardening tools, organic fertiliser, and receptacles for collecting rainwater. The selection of the vegetables grown was based on a nutritional analysis. “We work with spinach, chard, beets, broccoli, radishes and carrots, as well as native species like hierba mora and apazote (Chenopodium ambrosioides),” said Orozco. The ministry has set up 7,000 school gardens throughout the country, but because the others are not backed by inter-institutional cooperation like those in Totonicapán, acquiring the necessary inputs is much more challenging. The ministry has also requested technical support from other institutions to establish another 284 school gardens in Totonicapán. * The writer is an IPS correspondent. This story was originally published by Latin American newspapers that are part of the Tierramérica network. Tierramérica is a specialised news service produced by IPS with the backing of the United Nations Development Programme, United Nations Environment Programme and the World Bank.